Only a few short weeks remain until the official start of the Spring Grilling Season. Good times and good eating are just around the corner in your backyard or on your patio. We are going to look into the art of simple cooking using one of man's earliest cooking tools, the stick. Of course in this advanced society, we just come out and say we are "cooking on a stick". It's either skewering, brochetting or shish kebabing. The favorite skewer here in Central Texas is a green willow switch. Willows grow along stream banks. You select a fairly straight branch about the diameter of your little finger and snip it off the tree if Smoky Bear is not watching. Skin the bark off the switch and put a point on the thin end. (In the olden days, willow switches with the bark on was the favorite tool of parents wishing to get the attention of their children. They do sting). The best thing to put on the sharp end of a willow switch is a wiener. Hold the skewered wiener in close proximity to hot coals for a few minutes until the wiener swells up and the skin is a little charred. Slip the wiener off the switch into a hot-dog bun, add a little mustard and there you are. The younger crowd prefers marshmallows on the willow switch. They are instructed to hold the marshmallow "not too close to the fire" until it's toasted. Invariably one of the youngsters will poke the marshmallow right into the fire until it begins to flame and then the tad or tadess will either drop the whole switch in the fire or begin to flail it about in an effort to extinguish the flame, sticking the hot marshmallow to the bare skin of some adult or sibling which will create a lot of excitement. Let's just forget to buy marshmallows. If you don't have access to willow switches, you can find skewers at your kitchen shop or supermarket. In the Oriental section, you can find bamboo skewers. Get the longest ones you can find -- you can always cut them off if they are too long. There are also the wooden skewers that you find in your corndog which are usually too large in diameter to be good for anything but corndogs. Before using the wooden or bamboo skewers, soak them in water for several hours to prevent them from catching fire. There are metal skewers in all sizes. Something about twelve to sixteen inches long works well. If you can find some metal skewers that are not round, buy them. The edges on the non-round skewers keep the food from turning on the skewer when you rotate it. 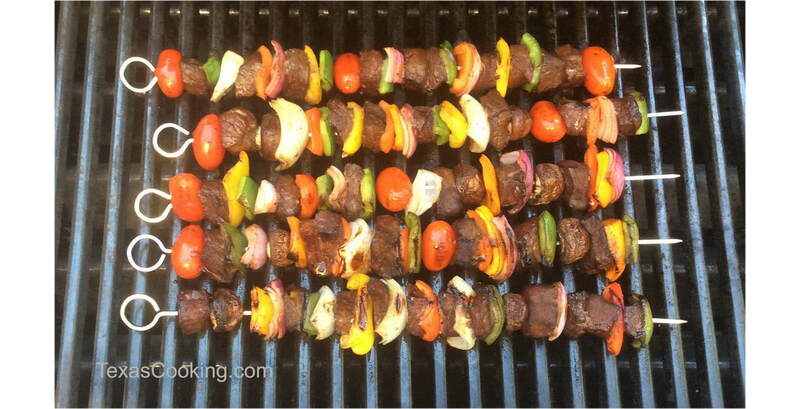 Look for skewers with insulated handles. The all-metal ones can get really hot, requiring you to use the hot pads or a pair of pliers to handle them. Skewers work best with a grill over your bed of coals. A grill that you can adjust from two to ten inches above the coals is an asset. Lacking a grill, you could arrange your coals between two bricks or concrete blocks which will support the skewers. Don't use natural rocks as some of them tend to explode when heated. Okay, got the skewers, got the coals, what do we cook? The answer is "anything you can get to stay on the skewer," which leaves out oatmeal and soup. Tradition says we use a combination of meat and vegetables on the skewers. For the meat, almost anything will do. Poultry, lamb, ham, pork, beef, solid fish such as tuna, or even sausage made great skewering. The more tender cuts work best. For the vegetables: onion, sweet peppers, mushrooms, squash, tomatoes, even cauliflower work very well. Select small vegetables for your skewering such as cherry tomatoes and small onions. They just look so good cooked whole. Squash can be sliced in one-half inch thick rounds and skewered sideways to expose the maximum surface to the coals. Button mushrooms go on whole. You can do small spring potatoes, but you need to boil them until almost done before putting them on the skewer. Select green, red and yellow sweet peppers and mix them up on the skewer for a great visual effect. Before using your skewers, give them a light brushing of oil, this will prevent the food from sticking to them and make for easy removal. A typical beef skewer would start with a small onion, then a cube of beef, a slice of sweet pepper, a mushroom, a slice of a different color sweet pepper, and another cube of beef. You get the idea. The meats will benefit greatly from a good marinade. Use the marinade for basting the meat and veggies while they are cooking, too. You can finish them off with your favorite barbecue sauce if you wish. Your more bland vegetables such as squash and cauliflower can be marinated also. When your skewered food is done, use the fork to slip over the skewer at the handle end and slip the food off into the plate or serving dish. Reload the skewer. Here's a couple of recipes I want you to try. Add the maple syrup and salt and pepper to the reserved pineapple juice. Thread alternating pieces of ham and pineapple on the skewers. Baste with the sauce while cooking over the coals from 8 to 10 minutes or until the sauce caramelizes. Let's grill up some fruit. Caramel made by slowly cooking 1 cup of sugar and a tablespoon of rum in a heavy saucepan until the mixture liquefies and is lightly browned. Cover and keep warm in a double boiler.